← Does the Bible Actually Say Homosexuality Is a Sin? The Bible says, “fish”. Popular culture says, “whale”. I think this may be a rare instance when popular culture got it right. The problem occurs when we attempt to apply modern taxonomical nomenclature to sea creatures of Jonah’s time. The term, “fish” was applied to all manner of sea creatures, including lobsters, clams and yes, whales. I think it is most likely a whale that would have swallowed Jonah. 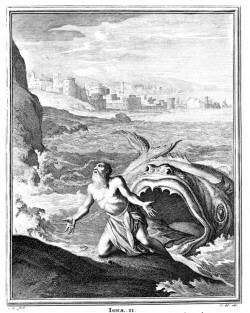 The creature’s mouth had to be large enough to swallow Jonah unscathed yet not allow Jonah to pass on through to the creatures stomach where he would have been injured be the gastric juices. Only certain species of whale fit the bill. Also, the creature had to surface frequently to refresh whatever air pocket which allowed Jonah to breath during his ordeal. Otherwise Jonah would have suffocated to death. So whale it is, so far as I can tell. Sure miracles happen, but from what I’ve experienced, most miracles are that of circumstance, coincidence or synchronicity. They usually do not violate the laws of nature. I prefer the most scientifically feasible explanation possible. This entry was posted in Bible, Ponderings and tagged Bible, nature, Science. Bookmark the permalink. But we can never change enough to impress God. And here's the reason: trying to impress God, others, or ourselves puts us at the center of our change project. It makes change all about my looking good. It is done for my glory. And that's pretty much the definition of sin. Sin is living for my glory instead of God's. Kurtis Karr's Blog > Christianity > Bible > Was Jonah Swallowed By a Fish Or A Whale?